What kind of Custom Binding Covers are there? Give us a call at (866)537-2244 (866)537-2244 for a quote. Call at (866)537-2244 (866)537-2244 for a quote. By far the most popular kind of custom cover, poly covers are made of a plastic material that is durable and easily wiped clean. Many clients feel they offer a more expensive look, while the cost remains reasonable, offering a higher value over many other options. They can also be customized in more ways than many other covers, so they are more versatile and can more easily meet the finished design requirements of most users. For example, poly comes in opaque solid colors, including a bright white for perfect printing, as well as semi-translucent frosted options and crystal clear options. This variety gives the appearance of many different covers, although all are made of the same poly plastic material. Depending on the opaqueness, the cover may be either polyethylene or polypropylene. Most customers prefer the semi-translucent or frosted clear poly cover. Depending on the design, a lot of clients will choose to combine both half-tone grays with vibrant colors that create a really stunning final look. The half-tone printing remains partially see-through, which does a wonderful job of elevating your binding cover to a new level of elegance. It gives the appearance of expensiveness, but uses less ink coverage, so actually costs less. The bright white of the opaque poly makes for the perfect starting point when you want a full-coverage print. It is a blank canvas that helps the printed colors pop and match your PSM or CMYK colors with precision. Poly covers can also be cut to any size you need, can be custom punched for a variety of different kinds of bindings (such as comb, wire, and coil), and can even be creased or scored to create pockets. They also come in several different thicknesses, so you can get a more flexible one or one that is rigid. 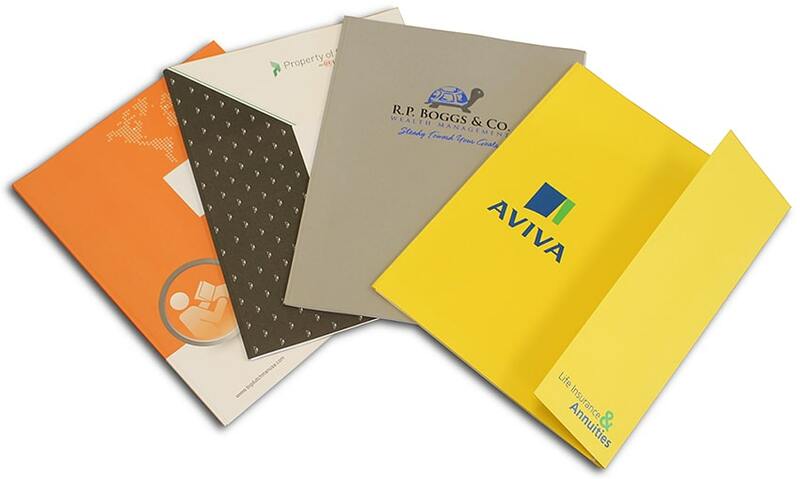 Vinyl covers are one of our most popular plain binding covers. They are think and sturdy, without being rigid. They have a texture that is often described as being leather-like, and looks expensive. Most users choose the standard vinyl, which is 15pt thick, but some will also prefer an even thicker 17pt cover option. When used plain, customers primarily use them as the back covers, but once they are personalized, they also make stunning front covers. Our vinyl covers, which are sometimes called regency covers, can be custom cut to any size you need, or easily punched for any kind of binding you may use. The printing options include silk screen ink as well as foil stamping with beautiful metallic foils. Custom cut windows, rounded corners, and more can also be made for you. Linen binding covers are perfect for those looking for a more soft and traditional look. They are textured with horizontal and vertical lines that give the look and feel of a linen fabric, though they are made of an 80 lb. paper cover stock. They are a classic report cover that look beautiful with customization, especially with a metallic foil stamp. 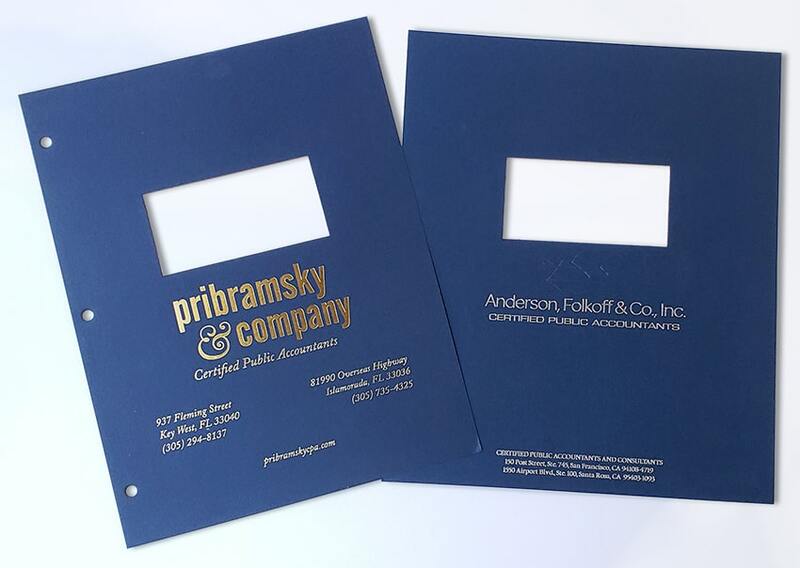 Custom linen binding covers are most often used by financial institutions like advisers, CPA's, accountants, law offices, and tax preparers. They can be creased and folded to create pockets and staple-hiders, as well as custom cut with windows to show a portion of your first page through. So you can foil stamp the front with your company logo, and have an opening that shows the title of the document or your client from the first page. A blind deboss adds another touch of elegance that is understated, but makes a big impression. Embossed grain report covers are made of an 80 lb. paper cover stock that has a leather-like texture and look, without affecting the feel of the cover, which still feels like a paper cover. They are not as popular as the linen, but are typically used by the same kinds of customers, which include mostly financial groups. These textured grain cover sheets are most often customized with a metallic foil stamp or blind deboss, which compliments the paper cover and texture. They can also get window cut outs to show a portion of your first page through, and come in several vibrant, but professional, colors including black, white, ivory, navy blue, light blue (called bold blue), and red. 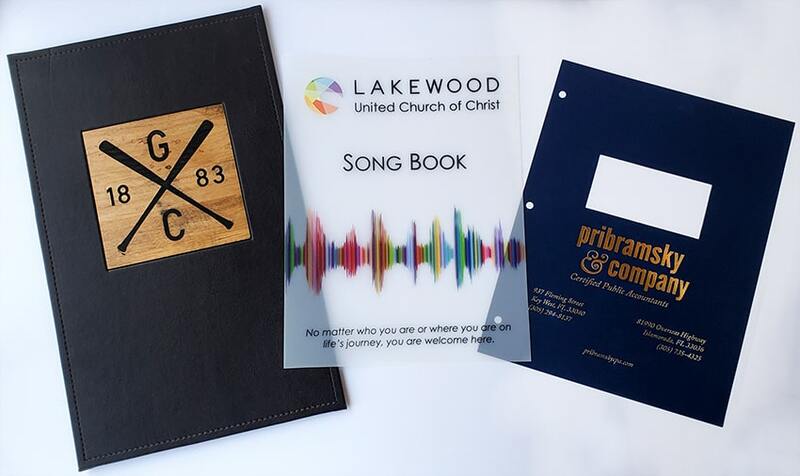 Custom chipboard covers, also called natural chipboard sheets, are a growing trend for presentations, notebook and binding covers, business cards, wedding invitations, and much more. 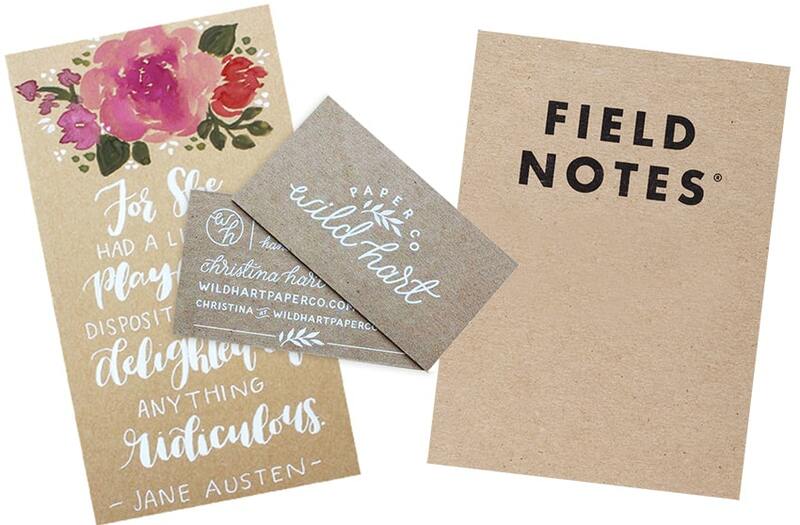 Their rustic appeal pairs perfectly with a variety of document types and, and they go great with soft pastel colors and elegant calligraphy text. 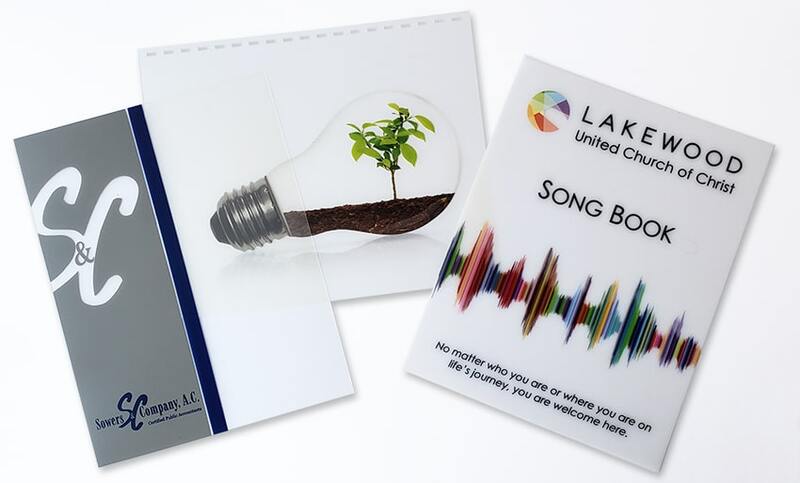 Custom chip board report covers come in several thicknesses, from thin and flexible 20pt (similar to a cereal box in thickness) up to completely rigid 140 point. We can cut these paperboard sheets to any size you need, as long as one dimension is at least 2"; so you can get a 2" x 2" square or a 1" x 5" strip. You can choose to simply get a custom size, a custom thickness, or get them custom printed (or any combination of those three). One of the appeals of a chip board cover sheet is that every pieve is unique; they are made from 100% recycled materials, so the color varies from shades of brown to gray, and they may have speckles and "imperfections" that add to the rustic, natural, earth-friendly, and one-of-a-kind look. There is nothing more appealing that a turned edge binding cover! Because we wrap a thick board with whatever material you choose, the options for the final look are truly endless. We have a huge swatch of materials and colors available, from basic vinyl to soft-touch smooth faux leather and even textured basketball materials. We can even add wood accents (as shown in the above photo) and so much more. Anything you can imagine, we can turn it into a turned edge report cover for you. And if we don't have the material, you can send it to us. Most often used as menus for elegant restaurants, wineries, and gourmet eateries, turned edge covers can be bound a variety of different ways. They can be punched, however, most customers choose to have them bind in a less traditional way, to go along with the overall appeal. 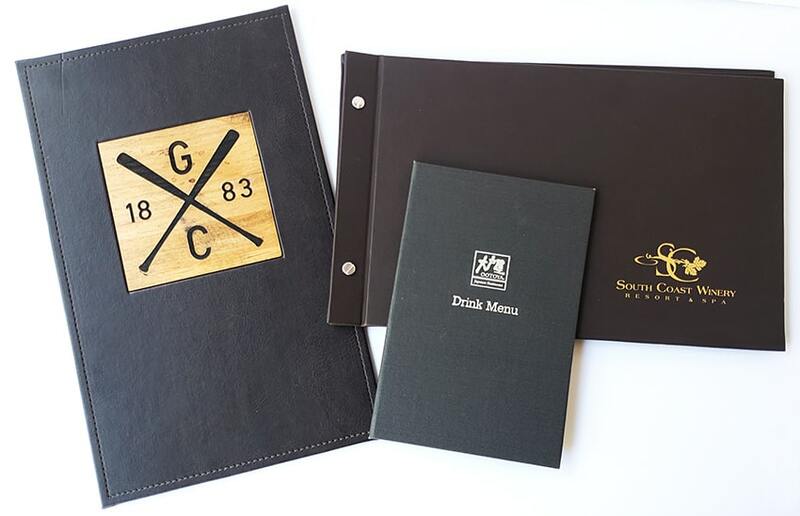 The cover shown on the left with the GC wood baseball design has corner pockets on the other side so that a laminated menu page can be inserted in, and easily changed out. The mini drink menu is a simple wrap that attaches a front and back, with the same corner pockets on both sides. The winery menu is bound with screw posts, and features a matching back cover. 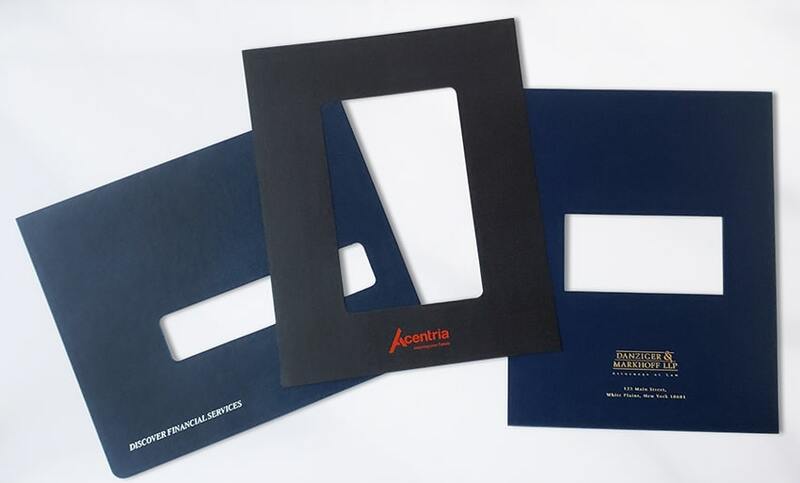 Custom thermal binding covers are unique, in that they have glue pre-applied to the spine that is then activated in a thermal binding machine to bind your pages into the cover. They are wrap-around covers --so always have a front, spine, and back-- and come in soft or hard cover styles. Covers starting at 6 ¾" H x 6" W and with spine sizes from 1/16" to 2" are available in most styles, so you can choose your final binding capacity. 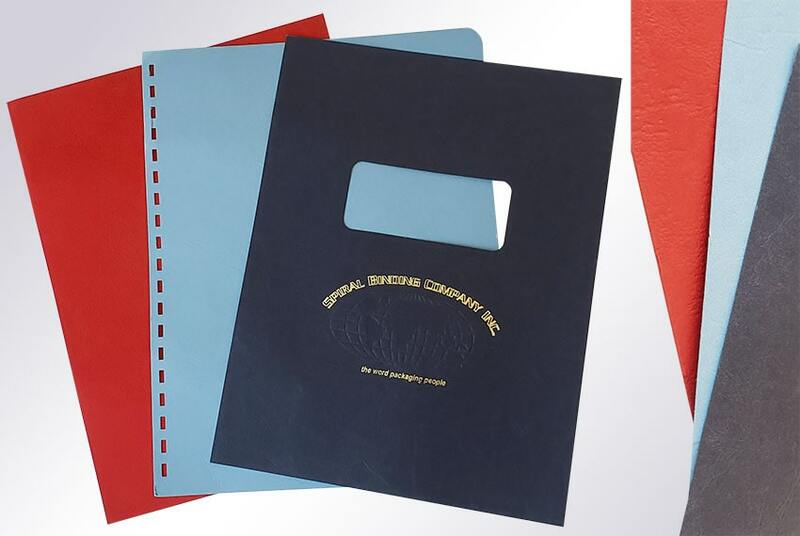 Personalized thermal binding covers are a smart choice for those who already have a thermal binding machine, or want to invest into this strong and professional document binding method. 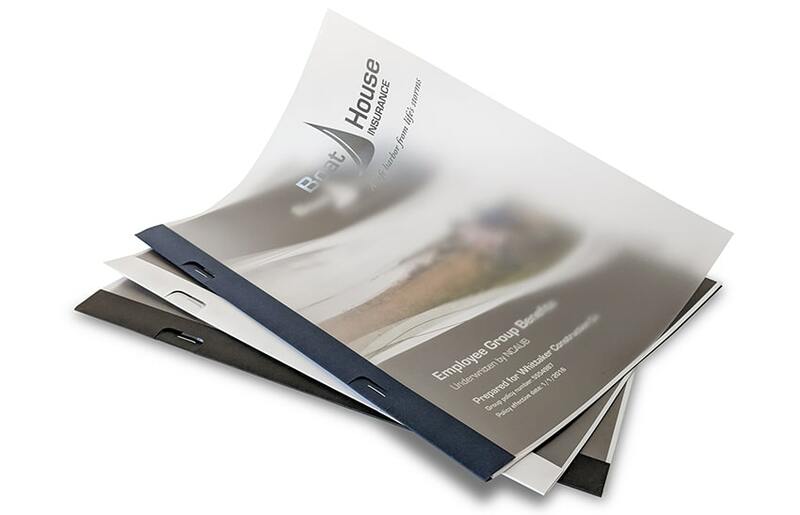 Our side staple binding covers are a popular quick-bind choice for businesses of all kinds. They look much more professional than a basic staple, without requiring any need for binding equipment of any kind. These covers are available plain with a clear frosted front cover, or you can get the cover foil stamped with a beautiful metallic logo or company information. We really can do it all, so call a sales specialist at (866)537-2244 (866)537-2244 to discuss your individual needs, and we will get you a personalized binding cover quote.